His Grace Youhanon Mar Chrysostomos was born in 1954 to Mr KV Yohannan and Mrs Aleyamma Yohannan, Mannil Puthen Purayil, Kottoor, Thiruvalla. He had his early education in local schools at Kottoor, and college education at SB College, Chenganachery. After his BSc from the University of Kerala, he joined Orthodox Theological Seminary, Kottayam, and took his GST and BD from Serampore University. He did his MTH from United Theological College, Bangalore, and PhD from The San Francisco Theological Seminary. Metropolitan Geevarghese Mar Osthathios ordained him as a deacon on 19 April 1982, and got his priesthood from HH Baselios Marthoma Mathews II on 5 June 1982. On 28 January 1998, H.H. Baselios Marthoma Mathews II made him a Ramban at Parumala Seminary. He was the Secretary of the Karunagiri MGD Ashram and Balabhavan. He has held the post of Principal, St Paul�s Mission Training Center, Mavelikkara, visiting faculty of St Thomas Orthodox Theological Seminary, Nagpur, coordinator of Malankara Orthodox Mission Board, St Thomas Karunya Guidance Center, Ulloor, Trivandrum, Karunya Vishranthi Bhavan Kattela, Trivandrum, Marriage Assistance Foundation (MAF), Sick Aid Foundation (SAF), Member of Malankara Association Managing Committee, Council Member of Parumala Seminary, Member of Catholic-Orthodox Dialogue Commission and many other posts of distinction. Besides being a scholar, exceptionally good organizer, preacher at conventions, he has participated in and given leadership to many meetings and also to many conferences. He was elevated to the post of Metropolitan on 5 March 2005 by HH Baselios Mathews II along with His Grace Mar Gregorios, His Grace Mar Theophilos, and His Grace Mar Dionysius at Parumala Seminary. 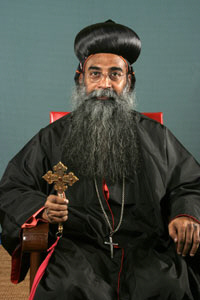 He took the mantle of Niranam Diocese from His Grace Geevarghese Mar Osthathios in 2007.